Ada head coach for boys basketball Ron Anderson left this for me the other day, as a “thank you” for making so many photos during their season, including the ones in this collage. As my readers know, my duties as a news photographer include covering area school activities, from the first grueling two-a-day football practices in early August to the proud and nervous graduations in May. Each year I seem to get to know the kids a little better and get a little more involved in their lives. 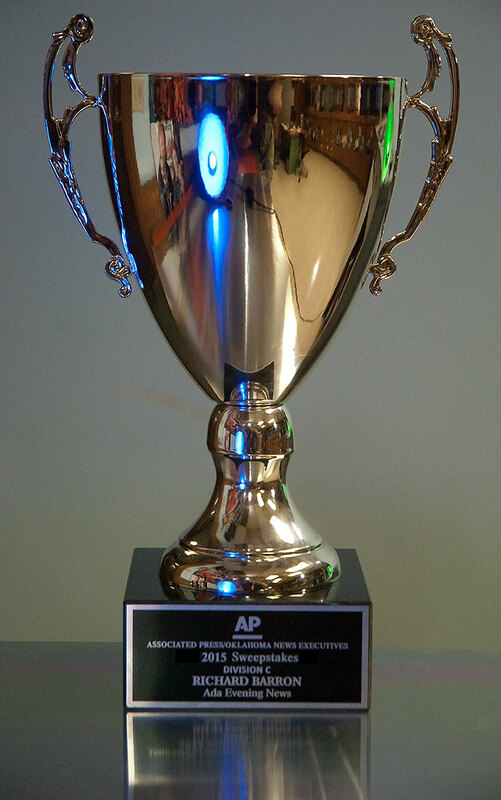 An nice surprise: an AP/ONE sweepstakes award for images of area flooding last year. The 2015-2016 school year was a particularly involving year for me, and for some reason, as I stood in the Cougar Activity Center last night surrounded by kids I photographed for essentially their whole lives, who were surrounded by their parents, who I essentially photographed their whole lives, I felt an acute sense of loss. I felt it far more than I did at my own high school graduation, and in some very important ways, I get more involved in their lives of the people I cover than I did with the people with whom I went to school. This school year was complicated by the fact that for much of it, my newspaper had a staff member who made it difficult for us to do our jobs well. Despite this obstacle, I stubbornly continued to document these young lives. That staff member is gone, replaced by a talented and eager person who likes and respects my work. I thought of that last night at Ada’s graduation, about how I wanted to push my images to the edge, to make them as good as I’ve got, since I knew they’d be appreciated and used well in our publication. 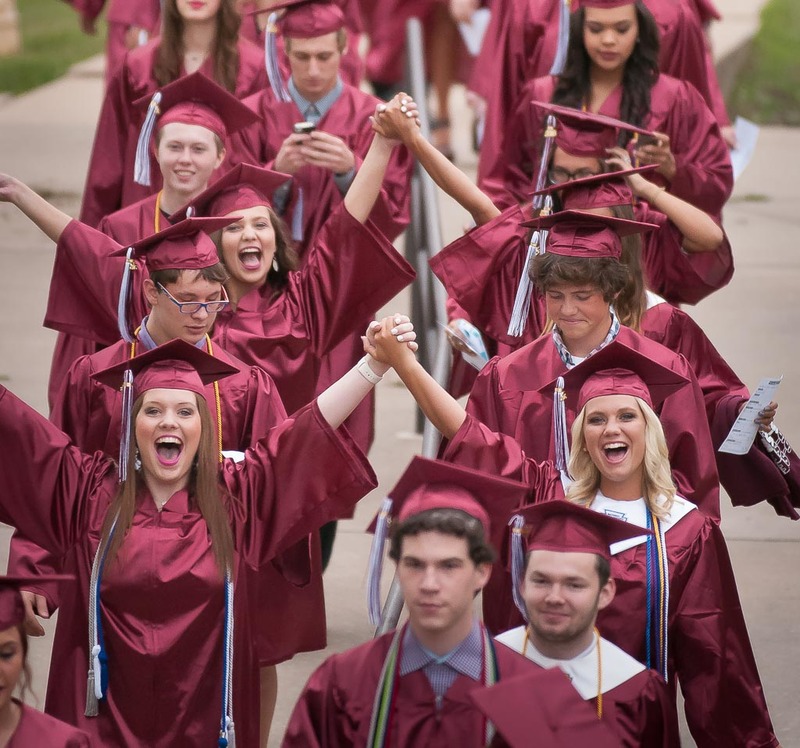 I was also amused by the way the kids at Ada High know me: as I watched them file from the school to the auditorium for last night’s commencement, a number of them waved at me and called me by name. Lastly, I was truly surprised that in the dark work environment of 2015, I was able to do work good enough to earn an Associated Press/Oklahoma News Executives sweepstakes award for coverage of last summer’s flooding. Bonus. As you can see, all the kids know who I am, and that I might put their pictures in the newspaper. I am so glad you hung on to overcome the Fog of Douchiness that had descended on your office. It’s heartening to know that can still happen. Congratulations on everything. Those kids on their phones though. Tsk. Anyway, super proud and not a bit surprised about your award! I have a laminated picture on my fridge that you took of my son playing tennis when he was 7 or 8 years old. Last weekend you took pictures of him winning a state tennis championship. Those are wonderful memories and you capture them perfectly. Keep up the good work! That is exactly my sentiment, Amy. I strive to do more than decorate the front page or sell papers. I strive to be our community’s visual historian. Add that to the business card. Richard, Ada is lucky to have you, as I’m sure many of them have realized by now.